Kolkata Biryani House serves some amazing mutton biryani in true Kolkata style. If there’s one thing common in most eastern states of the country, it’s their love for potatoes in everything. The same is with Kolkata, and their biryanis. 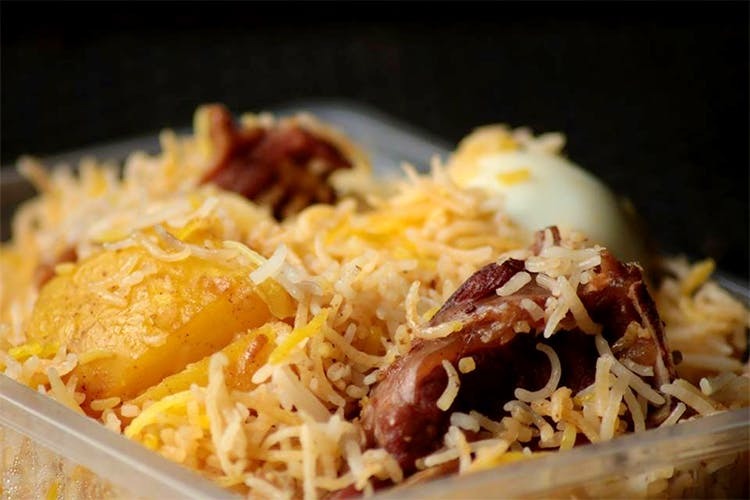 Kolkata Biryani House serves some authentic Kolkata-style biryani, which comes with two big pieces of tender mutton, boiled potatoes, a hard-boiled egg, and some gravy to go with it all. Beware—this is so fragrant, your room will be smelling of biryani long after you’re done. While folks from northern regions of the country might find the potato in the biryani a tad strange, we highly recommend you give it a shot. There’s something about big halves of well-flavoured and nicely boiled potatoes that nothing else can replace. They’ve got three more varieties of biryani—chicken, egg, and vegetarian. If you’ve got a real hankering for Kolkata-style Mughlai food, they’ve got dishes such as Chicken Rezala, Mutton Kosha, and Mutton Chaap too.